Seriously, how can you go wrong with cream and butter? I saw this recipe on Orangette, and knew I had to try it. It’s wintry and comforting and cozy and creamy and decadent and delicious. I seriously doubt I’ll make it that often, as I feel guilty just WRITING the amount of cream that goes into it, but here it is. Maybe this will become a new holiday dish…instead of green bean casserole, maybe? The Brussels sprouts lose much of their bitterness, and the lemon juice adds a bit of brightness to what might otherwise be a heavy dish. I mean, it’s heavy, in a caloric sense, but not in a flavor sense. I served these alongside a seared tilapia fillet (just sprinkle the fillet with salt and pepper, then sear in olive oil…my favorite way to cook tilapia). So one day, when you feel like having something decadent AND you want to get in a vegetable, try this. In a large skillet, melt butter over medium-high heat. Add the Brussels sprouts and salt. Cook, stirring occasionally, until the sprouts are browned in spots, about 5 minutes. Add the cream, stir to mix, then cover the pan. Reduce heat to low and simmer for 25 – 30 minutes, until sprouts are tender. Stir in lemon juice; taste for seasoning. Simmer uncovered for 1 to 2 minutes more to thicken the sauce a bit. Serve immediately. Adapted from Orangette, who adapted it from All About Braising. 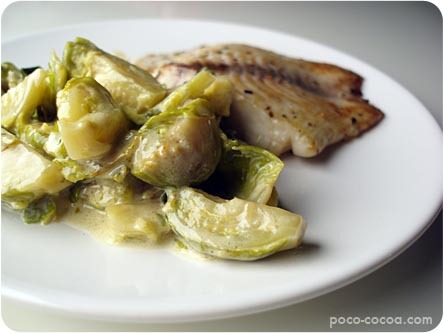 I am not a brussel sprout fan, but I think this recipe could change my mind. I like the sound of these brussels sprouts! I give this recipe a two sprouts up!